I am a firm believer that the root cause for many of the current economic problems in the UK is houses. Since Thatcher’s government introduced the right to buy the British population has clamoured to own houses and increasingly beyond our means. 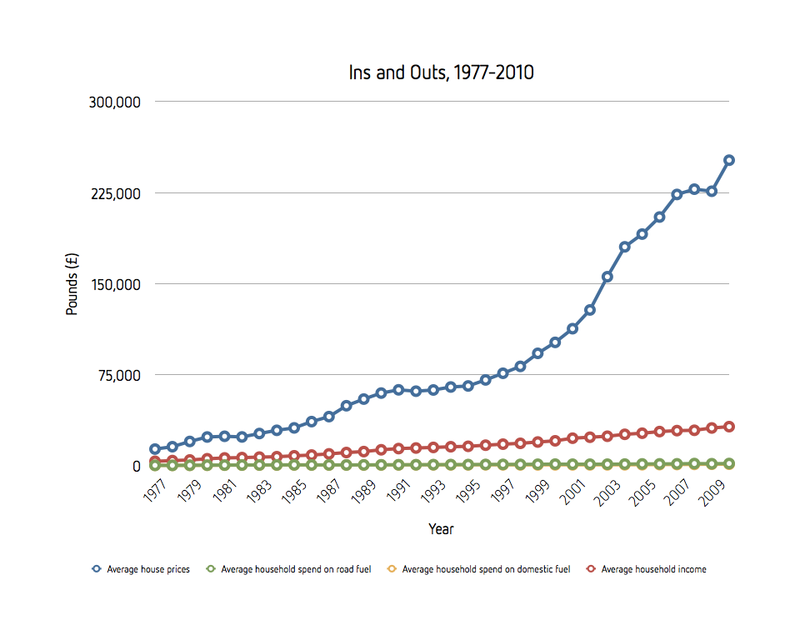 The net result (apart from the excessive borrowing of fictional money from banks) has been a continual rise in house prices – a boon to our parents’ generation – and increasingly poor conditions for those (like me) who choose to rent. Rant aside I thought it would be interesting to see how (or if) house prices have changed compared to average household income over my lifetime, along with two other main costs of living: the average cost of petrol and the average household energy costs. I’ve tried to summarise the results in two sets of graphs below: a comparison of household income, average house price and average fuel prices, and a comparison of house price and average fuel prices as a proportion of annual household income. For each have offered a linear view to show absolute comparisons, and a logarithmic view to show relative comparisons. 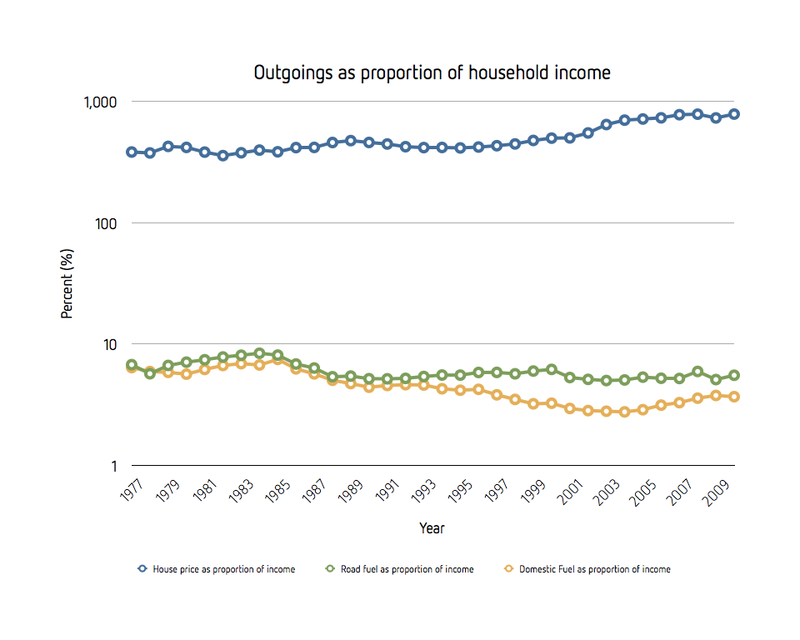 Whilst rising steadily, I was surprised that energy prices (house and road fuel) have been relatively constant in relation to household income – if anything they have actually fallen. However house prices themselves have rocketed and exponentially so. The average house price has risen a massive 1843% over the last 35 years. 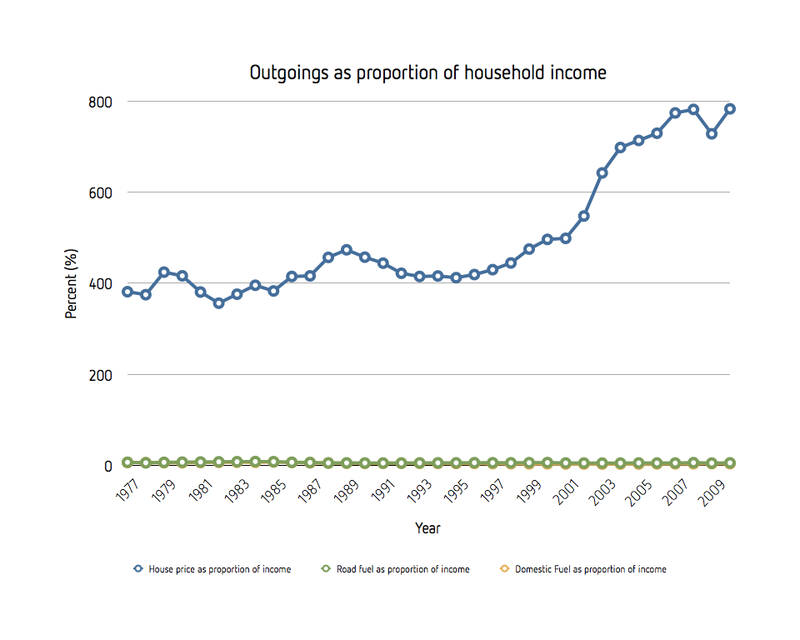 Now over this period we have also seen a significant rise in household income – average household income in 2010 is almost 9x what it was in 1977 – but no where near enough to cover rising house costs. In 1977 the average house price was 381% of average household income – however by 2010 this had risen to 783% – the affordability of housing has more than halved! I’m not offering any conclusions or interpretation here (nor judgement) rather a set of images that starkly show how dependent we have become on the banks – through borrowing – to fuel our need to own property and how this entrenched this might be in our current economic plight. Prior to arriving in Frome my last employer was the housing charity Shelter – at their HQ on Old St EC1. Thatcher was a dirty word around those offices. Despite sustained lobbying and eager promises from a succession of housing ministers, rectifying the damage done by Right to Buy continues to feel a long way off. When are govt (of any colour) going to properly address this basic human right? Adequate affordable shelter for all. Thank you for taking the time to highlight these shocking figures. Very informative post. My partner and I are looking to buy our own home (age 24) but it’s near on impossible. We both earn fairly good money, but unless you want to take out a loan in order to get the deposit together for a mortgage (create more debt) saving for the deposit is very difficult. We’ve done well so far saving over £7,000 but we’re not even half way there are 2 years of saving. What makes this even more difficult is that at the moment we’re renting, which is expensive. 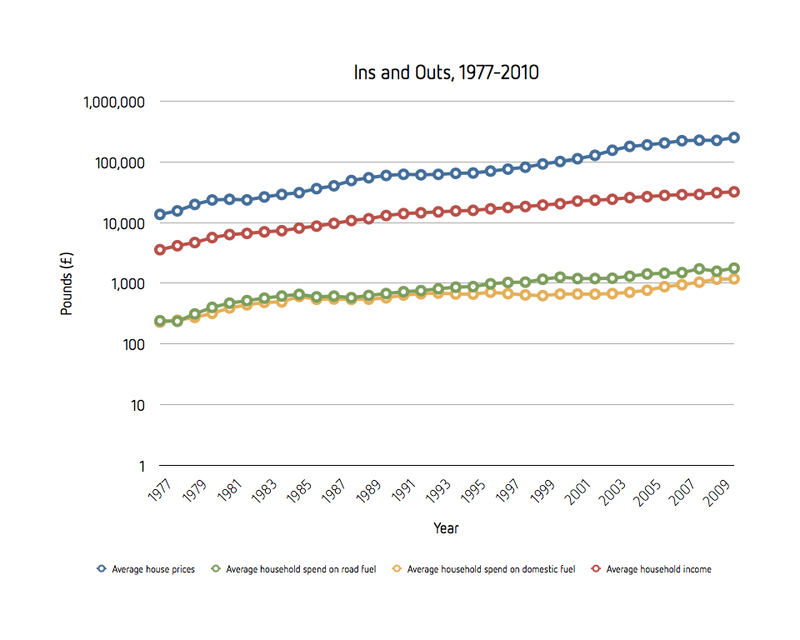 Maybe an idea for a new post – How Rent Prices Have changed! Frightening to see those figures presented so starkly. Unfortunately everyday I hear stories of homeowners that reached breaking point due to the financial burden of homeownership. The banks clearly have played their part having flooded the market with cheap money and allowing people to over stretch themselves in ways that were clearly irresponsible. Vulnerable people are now being made homeless and what’s worse is that there is a whole other industry just waiting in the wings to take advantage. Thankfully the OFT has finally woken up to this and are soon to regulate the property vultures looking to profit from homeowners looking to avoid the inevitable repercussions of mortgage arrears. Slightly off topic however, I’d like, if I may, respond to Gavin’s comment and point out that it’s a little unfair to tar the entire industry he’s talking about as “vultures”. The service provided by these sorts of companies (my own included) can be of immense value to those in dire need. The traditional model for a UK property transaction is seriously flawed due to a buyers ability to pull out of a purchase at anytime up to exchange. 1 in 3 property sales fail (liquidity is a big problem in this sector) and thus those that “need to sell” find themselves in a very precarious situation. There are firms who service this need and are committed to transparency, fairness etc.. Firms that actually already comply with the guidance that Gavin himself has published on this matter – http://www.theadvisory.co.uk/cash-buying-specialists.php – i welcome the OFT’s investigation and agree there are those that need to be removed from the industry however, as mentioned, not all of us are “vultures”.